I began by looking back at some films that might fit with my film’s message and captured screenshots of things that stood out for me. I have a general sense of what I am looking for, but working in this way is helping me to refine the vague picture I had in my head. Interestingly, it has provided me with options I hadn’t thought of before. This is a time consuming, but extremely fruitful process. I also looked at Christopher Kenworthy’s series of ‘Master Shots’ books. There are currently three books in the series, each one a thorough manual on how to think about cinematic storytelling from the camera’s perspective. 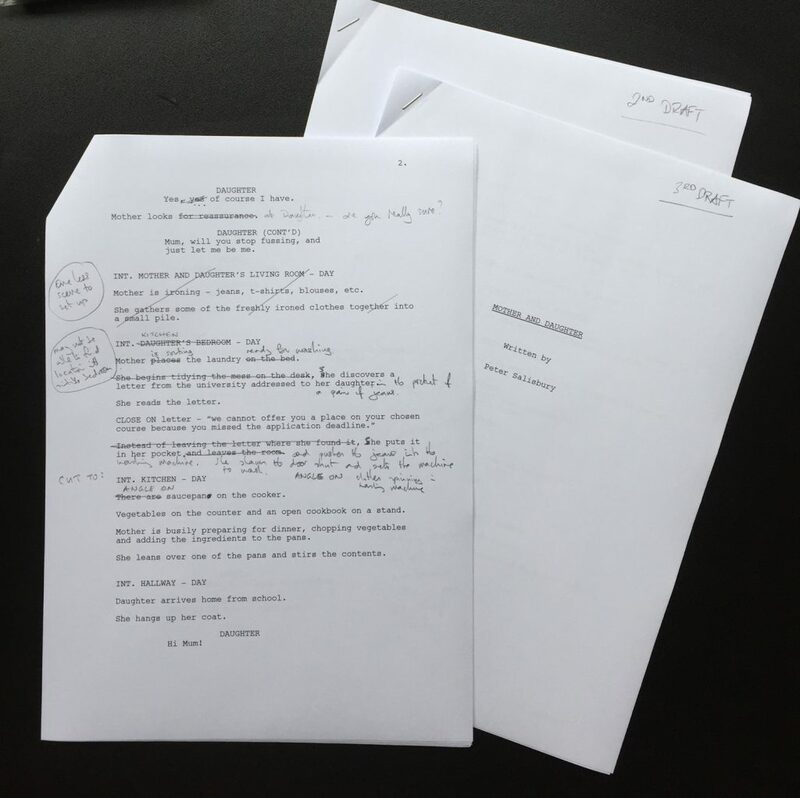 Taking the script as my blueprint for the moving image, I went through each scene in my screenplay looking for ways to tell the story in a way that would be visually interesting and compelling for the viewer. One idea I have for the opening scene is to shoot the entire action in one long take. Using a wide shot and shooting a long take would allow the viewer to read the subtext behind the action without the camera telling them where to look and who to look at. Some notable examples of this style can be found in films by Roy Anderson, Jim Jarmusch and Joann Hogg. 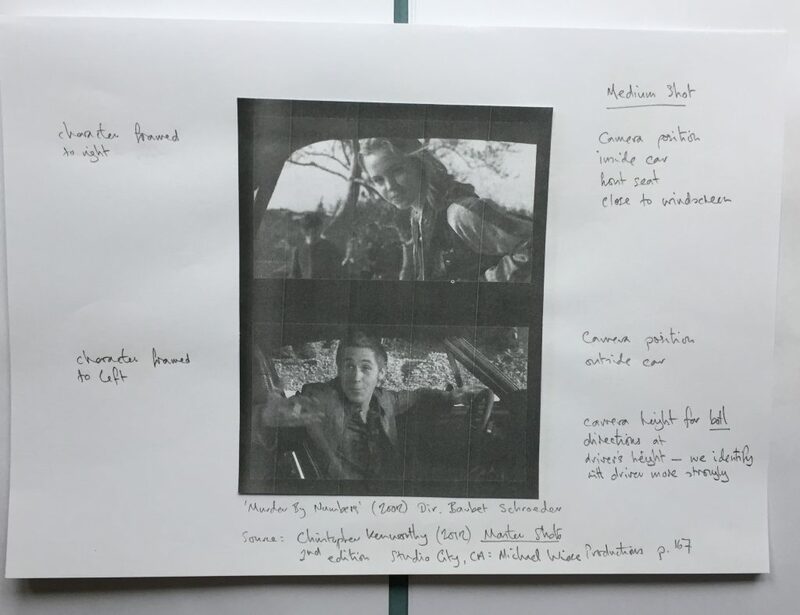 I also looked at more specific ways of designing the shots for the car sequence at the start of the film, by looking at some of the ways in which other filmmakers have approached shooting dialogue scenes in cars. I think it would be nice to match shot the image of the mother and daughter on the sofa (scene 1) with them in the car (scene 2). Mother on the left and daughter on the right. Both silent, locked in their own individual worlds. The first was a two shot through the windscreen. A fairly common camera set-up. But it was only after placing two shots from two films by Richard Linklater side by side, that I realised the shots (fig. 2) contained very subtle differences in camera set-up. At first glance, you could be mistaken for thinking the camera was placed in the centre of the car’s bonnet. On closer analysis, it becomes clear that the camera is placed to one side of the bonnet. 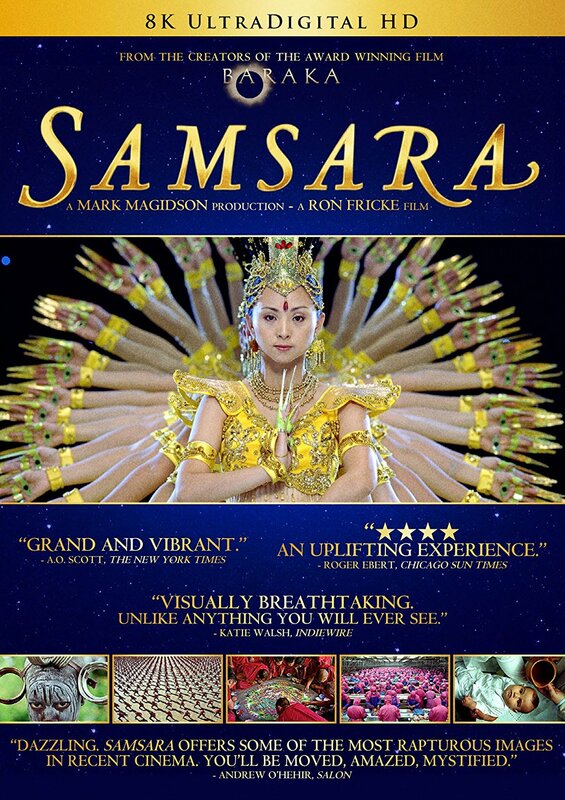 While the actors are positioned symmetrically within the frame, the shot itself is not a full-on symmetrical image. There is a slight angle on the z-axis. This subtle shift in camera placement changes the emphasis of the image. In the shot from ‘Before Midnight’, the camera is positioned on the left side of the bonnet, in line with the passenger. While in the shot from ‘Boyhood’, the camera is positioned on the right side of the bonnet, in line with the driver. This results in a subtle difference in the feel of each shot. As a viewer, I felt ‘closer’ to the actor in line with the camera. In ‘Before Midnight’, we are listening to the female character, while watching the male character’s reactions to what she is saying. 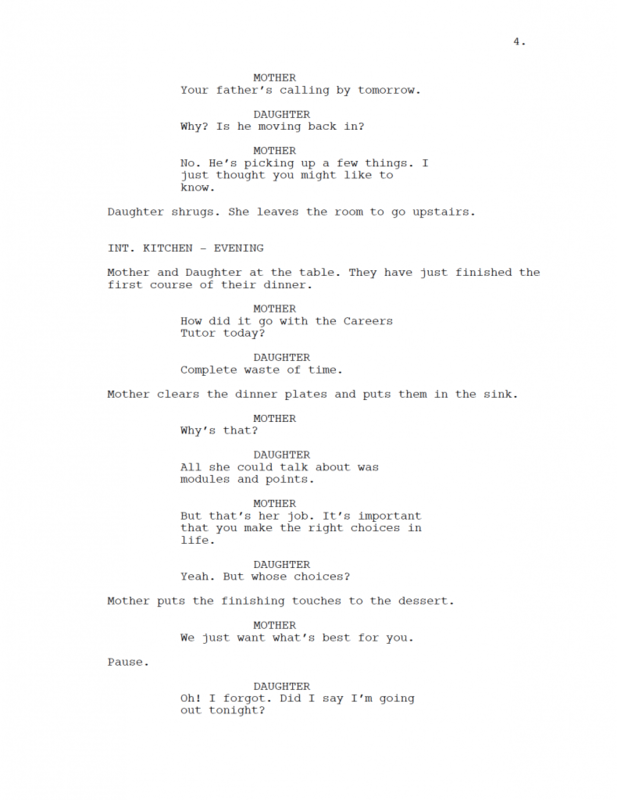 In ‘Boyhood’, we are watching the male character’s response to the female character talking. In each case, the emphasis is placed upon whichever character is ‘closer’ to the camera. A very subtle difference in camera set-up, resulting in a specific emotional response in the viewer. However, to set-up this shot would require using a car-mount on the bonnet. 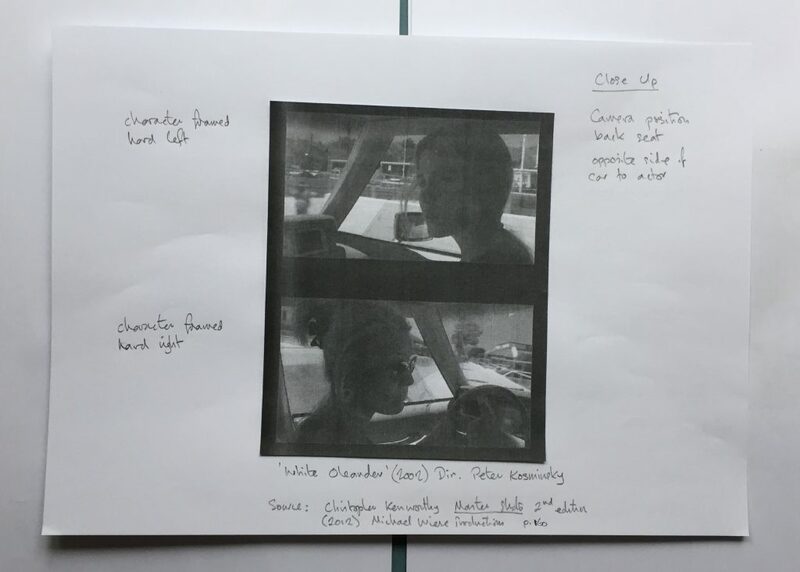 An alternative way of shooting dialogue scenes inside a car, suggested by Christopher Kenworthy (2012), is to place the camera in the back seat and position the camera on the opposite side of the car to the actor (fig. 3). This camera set-up avoids the need for a car-mount on the bonnet. When framing these shots, the driver needs to be framed hard on the left, and the passenger needs to be framed hard on the right. Kenworthy suggests giving the actors ‘plenty of motivation to look at each other; this shouldn’t be a casual chat, but a conversation that forces them to make eye contact’ (Kenworthy 2012, p.160). 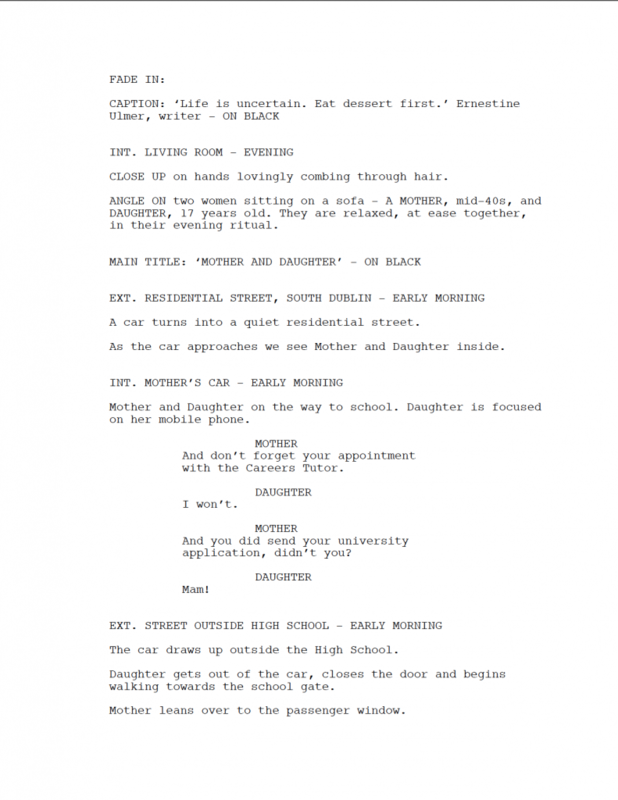 The car sequence in this assignment film ends with the daughter getting out of the car and the mother calling her back. Again, Kenworthy suggests a way of shooting a scene in which one character is inside the car and the other is outside (fig. 4). 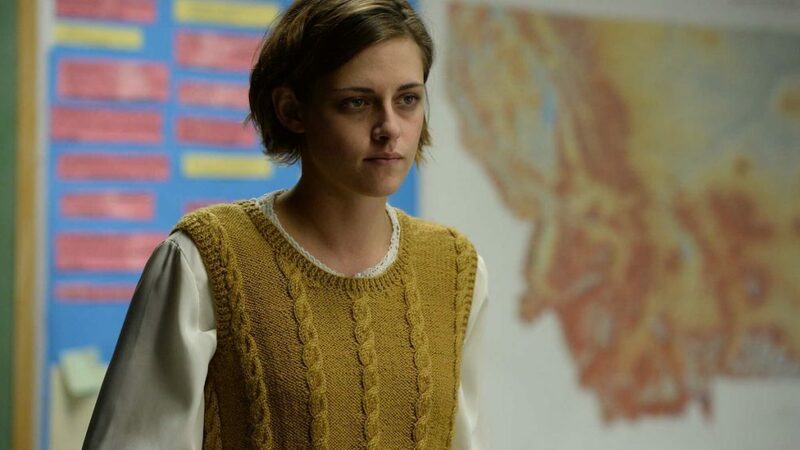 A film with a similar look and feel to that which I am aiming to achieve is Certain Women (2017), directed by Kelly Reichardt. I re-watched the film paying particular attention to Reichardt’s approach to composition and her use of colour and light. Figure 1. Visual reference material. Annotated screenshots from ‘Before Midnight’ (2013) and ‘Boyhood’ (2014) Dir. Richard Linklater. Figure 2. Visual reference material. Annotated screenshots from ‘White Oleander’ (2002) Dir. Peter Kosminsky. Figure 3. Visual reference material. Annotated screenshots from ‘Murder by Numbers’ (2002) Dir. Barbet Schroeder. 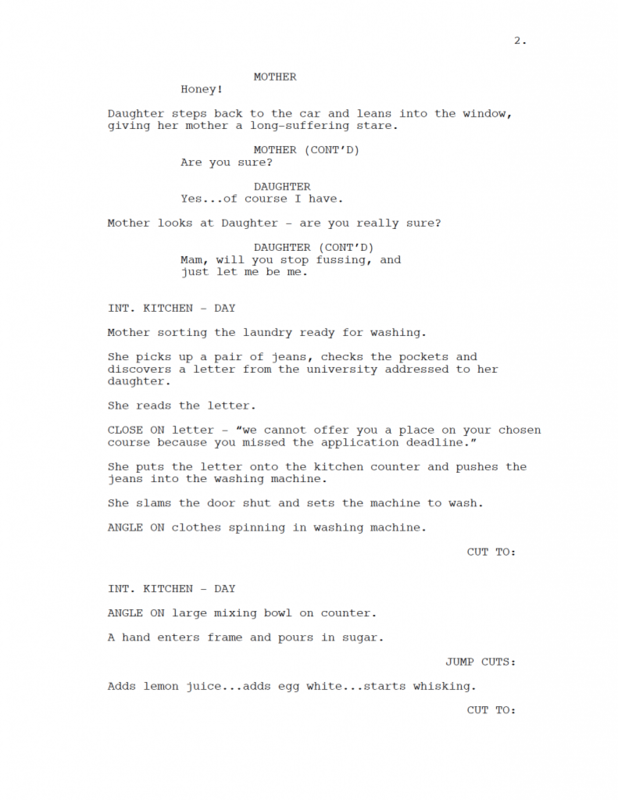 This screenplay captures a single moment in time in the lives of a single mother and her teenage daughter. A moment in which things don’t go quite as expected for either of them. The assignment brief required me to ‘create a short narrative film with a clearly defined conflict showing the main protagonist attempting to overcome or solve the conflict.’ At five and a half pages, it’s a very short screenplay. Everything takes place in a single day. 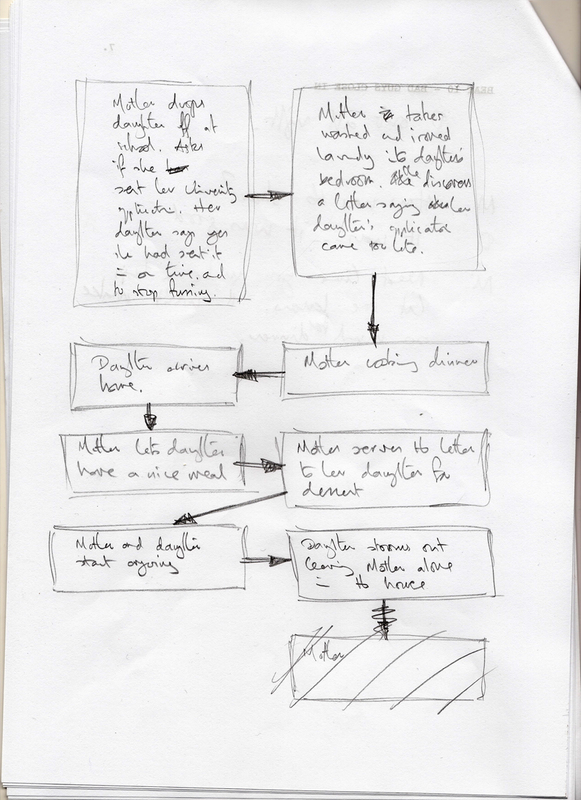 But, all the structural elements are there (opening image, theme stated, set-up, catalyst, midpoint, climax, final image) and the conflict is clearly defined, in that both characters objectives are clearly stated: Mother wants her daughter to finish school and go to university; Daughter wants to take a gap year. We also see the main protagonist (Mother) attempt to solve the conflict, if in a somewhat unusual way. I have intentionally left it open-ended, in that we don’t know what will become of Mother and Daughter, though we are aware things may never be the same again. It is also a narrative which I think captures the essence of the short film’s ability to ‘deliver a short, intense burst of emotion’ (Nash 2012, p.110). What captured my imagination about this idea is Mother’s response to finding the letter in Daughter’s pocket – on discovering the deceit, she lets her daughter have a nice meal, then serves the letter up in a dessert specially prepared for the occasion. It reminds me of Ernestine Ulmer’s quote ‘Life is uncertain. Eat dessert first.’ I can’t remember where or when she said this, but I have since seen it on the walls or pavement boards of several Dublin cafes. I like the idea of combining the ‘uncertainty’ and the ‘dessert’ in some way, of making a moving image that taps into both the concrete and the less tangible, abstract aspects of life – ‘Eat dessert’ is a fairly concrete action; while ‘Life is uncertain’ is an existential outlook on what it means to be human. If that makes any sense. I have chosen pavlova for the dessert because, although a simple recipe, it is often something that is served during celebratory and holiday meals. I think this will add an element of irony to the scene as, in Mother’s eyes, there is nothing celebratory about the meal. 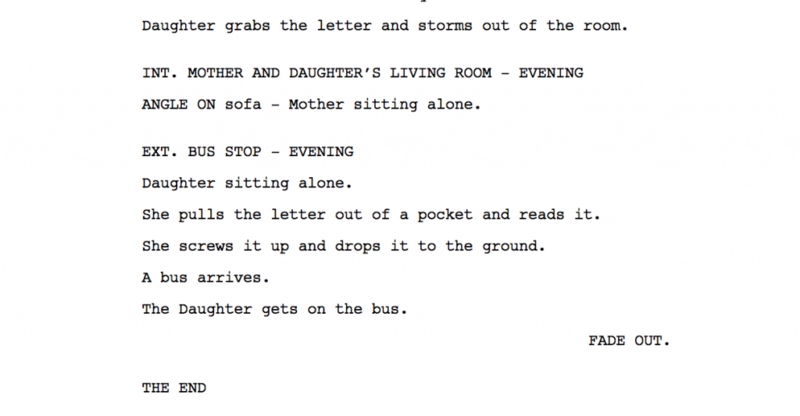 I see this script as just a blueprint for the finished moving image. 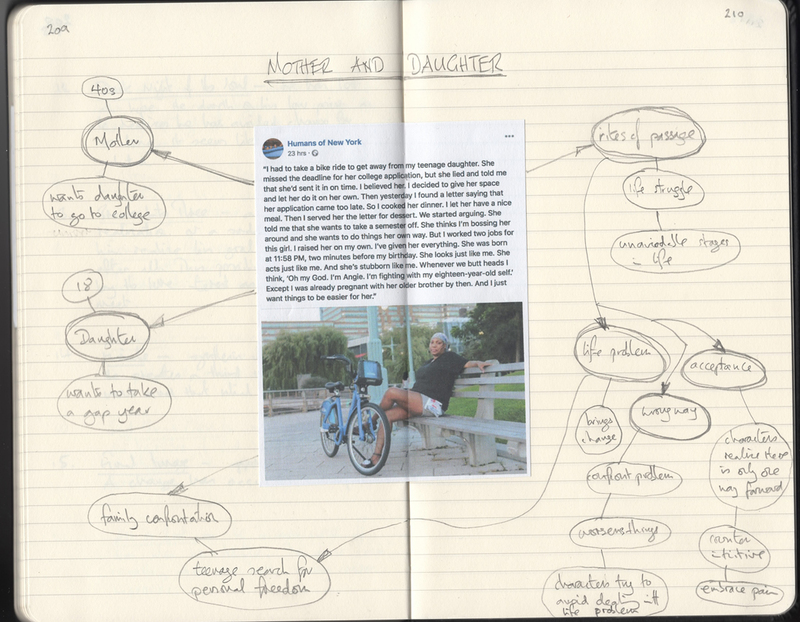 I have purposely kept descriptions to a minimum, giving only the basic information needed to help the reader to get a sense of the story – characters, locations, actions. A lot will depend on how well I can stage the actors, light the scenes, and compose and frame the shots. 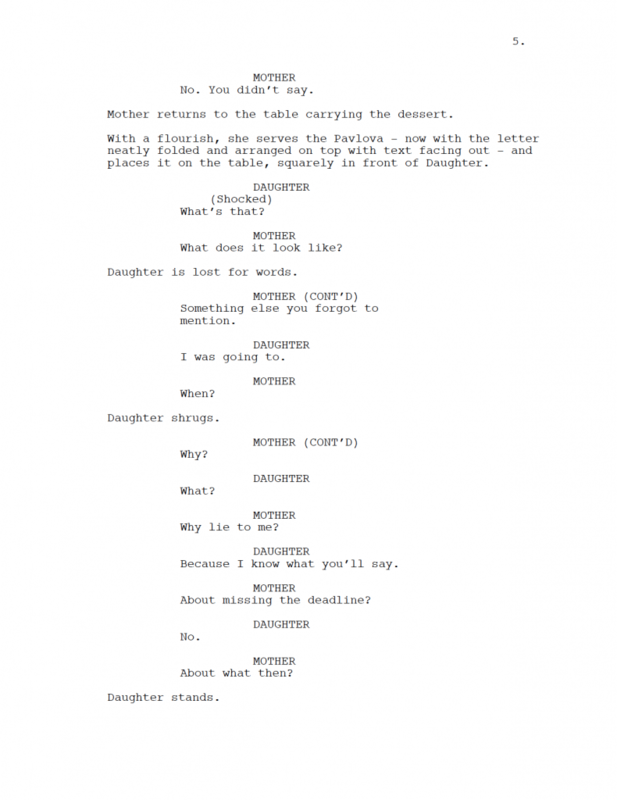 Looking back over the script, I notice there are several ways in which ‘uncertainty’ is embodied within the text: none of the characters are given names; the father’s presence is vague and undefined; why Mother decides to ‘confront’ Daughter with a dessert is unclear; the subtext beneath the Mother-Daughter relationship is vague; the open-ended ending leaves the viewer wondering what will happen between Mother and Daughter. All of this will add to the sense of ‘uncertainty’ within the film. 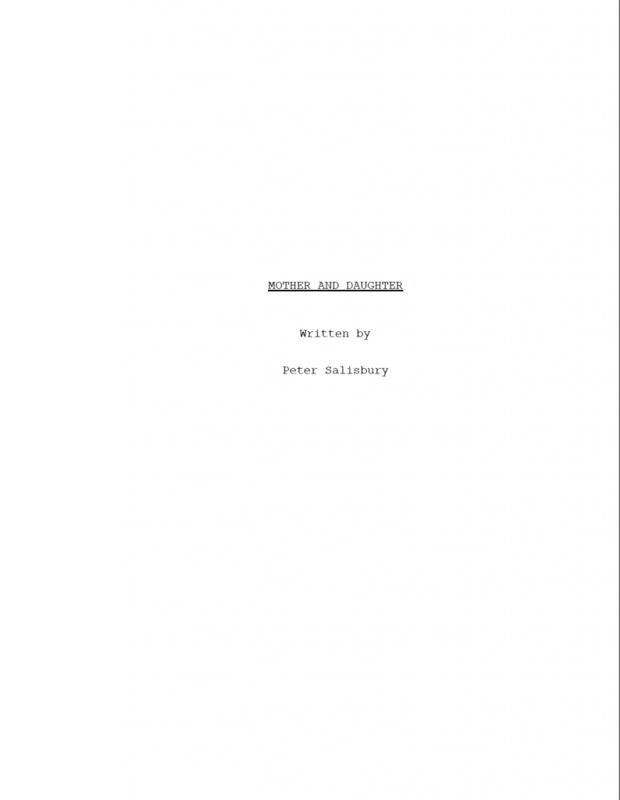 I put the screenplay up for peer review. One observation about the ending was particularly interesting, in that the reviewer said she ‘knew what the mother might do, but the daughter is more unknown’ (Emma 516689, 2018). 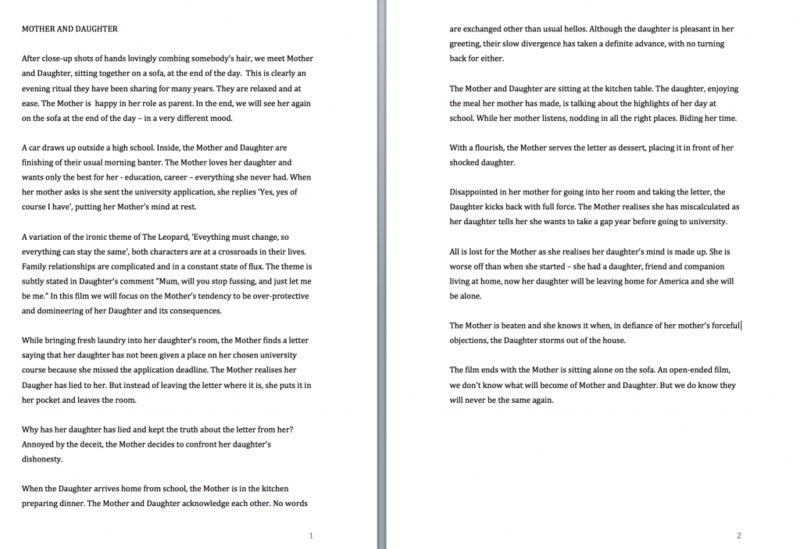 Her suggestion ‘I wonder if it would be worth investigating the daughter’s reaction at the end, rather than the mother’s’ made me re-think the effectiveness of the ending. 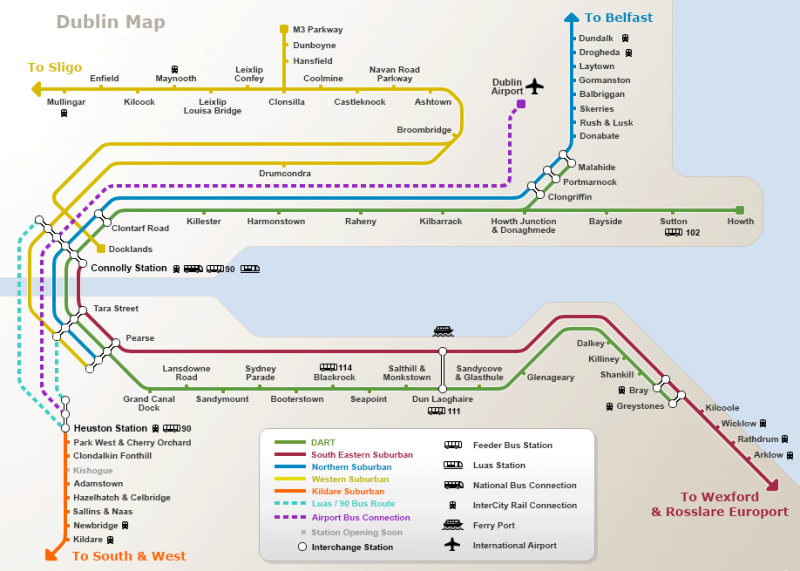 This was very helpful. I added another scene to the end of the film, in which we see the daughter’s reaction to the events at home. 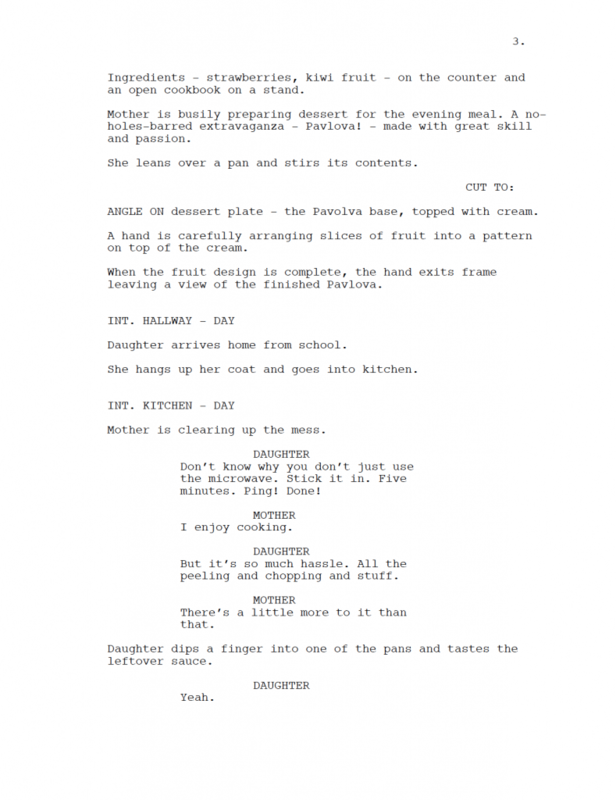 To accommodate this change to the ending, in which we see the Daughter at the bus stop reading the letter, I altered the description at the end of the kitchen scene to show her picking up the letter as she storms out of the room.